Especially over the past two years there have been many new product and application developments on the military market and just as many changes. However, manufacturers’ and users’ requirements and requests remained the same: weight reduction, robustness, ease of handling and secure transmission of a high number of signals in the smallest available space. Functionality under the most difficult conditions is a basic requirement for all connector technologies used in military applications. More than 70 years of experience, high vertical integration and overall knowledge under one roof – ODU convinces with high-quality standard products as well as with customer- and application-specific solutions. ODU’s premium connectors securely and reliably transmit data and signals, making them useful in an extremely diverse array of applications, for example in soldier modernization applications. The circular connectors are designed for e.g. group voice and data radio, navigation module, soldier control unit, rugged computers and handheld devices, GPS antennas, military night vision devices, unmanned systems and land vehicles. At one glance the ODU AMC series include four different types of connector solutions: ODU AMC High-Density, ODU AMC Push-Pull, ODU AMC Break-Away and ODU AMC Easy-Clean. With a diameter of less than 10 to 18.5 millimetres and a pole density of up to 40 contacts, the connector proves that functionality and premium-quality do not require a lot of space. Beside the multi-position signal connector, the product series has different versions for power, signal and data transmission, which provide the highest performance and functionality in a compact package. One of the main features is the space saving ODU AMC High-Density for USB 3.0 data transfer at a rate of 5 GBit/s. The miniature connector has a long service life of more than 5,000 mating cycles – even under severe environmental conditions; for example, the impact of water, dirt, salt, and temperature. Blind mating and optimised mechanical and color coding guarantee safe and simple handling. Through the Break-Away function, the reliable connection can be detached in an instant with a pull on the cable. 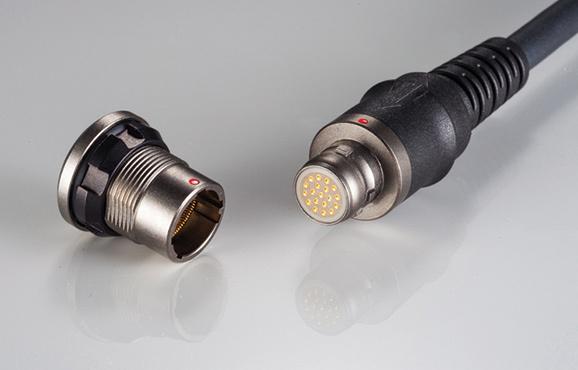 Different mating options are also key features of two more connector solutions of the AMC series. The ODU AMC Push-Pull design enables the mating and unmating of the connector with minimal force. 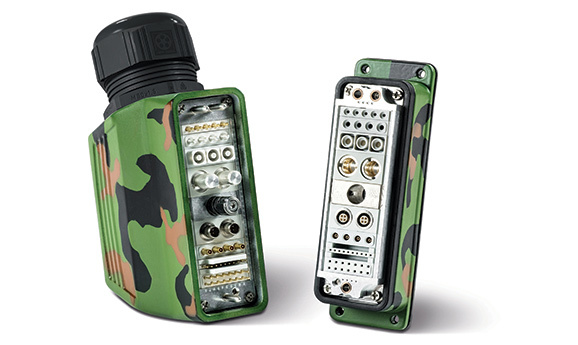 Beside this option, the connector solution offers a rugged housing with non-reflective surface, mechanical and color keying, 5,000 mating cycles durability, high-speed data technology, watertight – protection class IP 68 and IP 69 – and versatile configurations. For connectors that need to be mated and unmated fast during usage ODU designed the ODU AMC with Break-Away function. One pull on the cable is enough to unmate the connection. The plug incorporates a unique locking system with mechanical and color keying options. Also, the ODU AMC Easy Clean benefits of a Break-Away function. This plug’s contacts can be easily and quickly cleaned even in the harshest environments: The ODU AMC Easy Clean design was created using a unique spring loaded pin system that allows for an easy-wipe flat receptacle surface. The connector solution has a protection class IP 68 and IP 69, 7-19 positions, mechanical and color keying. The system solutions include also protective caps that ensure fast and trouble-free handling of the connectors and of the overall system and also integrated cable assembly solutions and overmolding. While the ODU AMC series is mainly used in soldier modernization applications, ODU offers a broad range of connector solutions. In radio and radar stations as well as transmission connectors in central electronic the ODU-MAC ensures reliable connections. “Our proven single contact technology is the base of many modules of ODU-MAC”, expounds Günter Rohr, Global Portfolio Manager. The open modular connector system combines the versatility of a rectangular connector with customizable modules to create countless custom connector variations for a wide variety of applications. Couple this with numerous housing options to create the perfect interface for transferring power, signal, pneumatic/fluid, fiber optic, coax and high speed data signals all in one easy to mate system. The result is an effective, compact and attractive overall connection with unsurpassed functionality. The ODU-MAC ensures reliable connections and is constantly updated with new features.